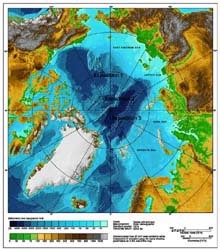 International bathymetric chart of the Arctic Ocean, with locations of proposed expeditions of the International Survey of Arctic Ridges and Basins. Click image for larger view. With the aid of a remotely operated vehicle (ROV) specially designed to operate under ice and at great depth, scientists examined the hidden world of life in these extreme conditions. Due to the Canada Basin's remote location, it was possible that they would encounter never before seen lifeforms. From intricate microscopic organisms found in the brine channels that run through the ice to the creatures that make the sea bottom their home, the science team studied the relationships between pelagic (deep-water) and benthic (bottom-dwelling) communities. They investigated the manner in which food energy is transferred from the surface of the ice, through the water column, and to the bottom of this harsh environment. In addition, they analyzed bottom sediments to determine their chemical makeup, as well as help reconstruct the climatic history and paleo-ecological events that formed the region. Background information for this expedition can be found on the left side of the page. Daily updates are included below. More detailed logs and summaries of exploration activities are found on the right. Summary The Arctic Expedition is over. Read what each of the science teams discovered as they recap the highlights of the cruise! September 6 A scientist on board, Mike Vechionne, discusses similarities and differences between the Arctic and Antarctic, based on his personal research experience. Also, Arctic Science Journeys Radio conducts an audio interview with the science party. September 5 A The benthic team "gets to the bottom" to observe sea floor communities. The ROV spots several interesting inhabitants among the soft sediments. September 1 Scientist Terry Whitledge discusses microscopic phytoplankton and how they collect and study these tiny plants. August 31 Explore the midwater realm with an ROV dive that captures fascinating and vibrantly-colored organisms within the water column. August 30 What lies beneath the ice? Read about Paul Nicklen, a National Geographic photographer, and Jeremy Stewart, the Diving Supervisor, as they share their experiences of diving under the ice. August 26 Within the channels and crevasses of the ice, millions of organisms inhabit the ice floes. Scientists conduct sea ice sampling to learn about sea ice ecology. August 25 A close encounter with a curious polar bear creates excitement during the early morning shift and inspires a poem. Also, Arctic Science Journeys Radio conducts an audio interview with the science party. August 24 The science team searches for life in this polar realm, discovering microbes, fish, clams, and worms, all hidden within and beneath the silent ice. August 22 After a few delays, the ROV Global Explorer conducted its first operational dive of the expedition! Read about the challenges encountered when conducting ROV operations in the Arctic, including the effects the north magnetic pole has on equipment. August 21 The scientists anchored a mooring line to the bottom of the sea floor. The instruments attached to this line have a variety of purposes, ranging from monitoring the ice, to recording the temperature and current direction. August 19 The sea ice team descended from the ship onto the ice floes, collecting ice samples, as well as diving beneath the ice floes in search of life. August 17 The "mud people," or the benthic science team picked through the first box core sample, getting muddy, and finding fascinating benthic organisms, no larger than a few centimeters. August 15 Expect the unexpected. An ROV test dive had to be relocated farther south, since hard, thick ice covered the original site. After receiving a distress call, the ship performed a rescue mission, and then steamed toward the first site, Amundsen Gulf.